From a very long time, a debate us going on about, whether it is better to wash dishes by hands or by a dishwasher. There are many people who believe that washing dishes with hands is better than using a dishwasher because according to them it is good for health and environment. While on the other hand, researches and studies showed that dishwashers are actually more beneficial for health and for the environment as well. Dishwashers provides a better cleaning, prevent germs; they are environment friendly, time efficient, economically friendly, guest friendly and many more. Above them all, it makes our life easier. But, like all the other things, your dishwasher may also get faulty at some point of its life and needs to be changed. Let us discuss about some of the signs, which signifies that your dishwasher is ready to bid adieu. Most of the dishwashers are capable of giving you service for almost 10 years, but that can vary from time to time. If your dishwasher is more than 10 years old, then you must consider upgrading it. Many of the older models are not efficient enough to give you service. So, it will be considered to be wise decision if you change your dishwasher at that time because it will affect your electric bill as well as water bills dramatically. To avoid those mishaps, change your dishwasher as soon as possible. Rusting is a very significant sign, which implies that you may have to change the dishwasher as soon as possible. Although, a few spots of rust outside your dishwasher is not that lethal. But, if you can see rusts inside your dishwasher, then there is a chance that your dishwasher is leaked and broken as well. It is also very unhealthy for you because there is a possibility that some amount of rust is going to your dishes as well. To check if the rust is coming from inside or it is due to some of your rusty plates, apply some citric acid and observe if the rust is going away or not. Can you see water after the wash? If you can see standing water inside your dishwasher, even after the cleaning is done then it is the time you should think of buying a new dishwasher. It is a sign that the drain of the dishwasher is clogged. Sometimes, a small amount of food can create a minor blockage which can be fixed very easily. But, if that is not the case, then you may have an issue with the drain. For that, you need to call a professional plumber, or you need to replace the whole of your dishwasher. If you can see any cracks in your dishwasher, there is a chance that a big disaster is waiting for you. You will have to face a huge water damage, which will force you to lose a huge amount of money and time. 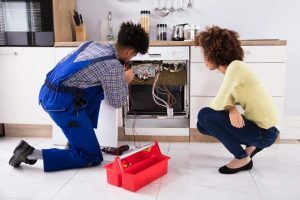 Mainly, these cracks and leaks are found in the interior tub of the dishwasher and they are a major sign, which implies that you need to replace your dishwasher immediately. It is advisable that if you can see any cracks or leakages in your dishwasher, you should stop using it then and there and look forward to repair it or to replace it, if possible. Can you hear unusual noises? A bunch of strange noises is a very prevalent sign that signifies that the time of your dishwasher has come to an end. Check the warranty period of your dishwasher before buying a new one. As discussed earlier, dishwasher is a very important part of our life. But when it gets faulty, it makes our life hard to live. So, go through the article very carefully and read the signs, which your dishwasher is giving to you.